Mirrors - To show any Autograph, Numbers, Etc. OF Plastic (Original Finish Plastic): refers to the original plastic horses produced by companies such as the Breyer Horse Company or the Peter Stone Company. 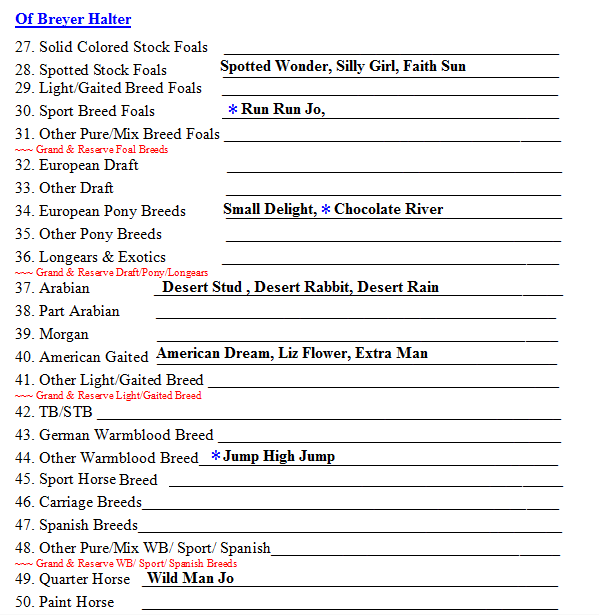 Many shows now further break this down to give separate classes to Breyer and Peter Stone Company horses. OF China/Resin (Original Finish Chinas and Resins): refers to professionally produced porcelain horses produced by companies such as Animal Artistry, Pour Horse Pottery, or Alchemy Fine China. Artist Resin: refers to professionally produced resin models which have been individually painted by professional or amateur artists. CM Plastic: typically refers to OF Plastic horses that have been repainted, haired, or resculpted, regardless of original material or manufacturer. The custom may be a drastic custom, where the original model is no longer recognisable, or a minimal custom. CM China (Custom Glazed Chinas): refers to professionally produced porcelain horses that have been individually re-glazed, whether by a professional or amateur. These classes evaluate the rarity and condition of models. Documentation as to why a given model is collectible (i.e. number produced, year made, Event etc. )(Original Document if any) is presented with the entry. Models in this division are always Original Finish models. These classes evaluate the finishwork of the model. Preparation work on the model before final painting, any re-sculpting work, and final painting are all considered. These models are never Original Finish models, although they may have begun as OF models. English Performance, where models are placed in simple dioramas reflecting the events of traditional English Hunter/Jumper and racing competitions. Western Performance, with divisions for stock work (cutting, roping), rodeo, reining and trail work as well as traditional western classes such as pleasure, horsemanship and trail. Other Performance, often includes the Costume class, where a model is judged by both its own conformation as well as the accuracy and craftsmanship of the costume it wears. Last Call - Means that the class is about to start being judged. This is your last chance to bring your entries to the table or make any tack/prop adjustments. Class Closed - Means that the class is now being judged. You can no longer touch your models on the table until the end of the class. Class has been pinned - Means that the judge is now finished and the ribbons have been placed on the table. You may now pick up your entries and ribbons. This is also when you may ask the judge questions about how they placed the class or what you could do better. Call Backs: After a group has concluded, all of the 1st and 2nd place horses from that group are called back for the naming of the Group Champion and Reserve Champion. Champion/Reserve Champion: The best two horses in the Call Back class. Division Champion/Reserve Champion: The two best horses in the Division Call Back Class. Best in Show: Some shows offer this class to bring the Division Champion and Reserve Champion of ALL Divisions (Stone, Breyer, Artist Resin, Custom, China, etc) to compete for the title of best horse in the show. This class is typically judged by the show hostess, and the decision is made by their preference and usually the type of Championship earned (Reserve or Regular) will not effect their decision. Every horse your showing will need a name and a Breed. For names have fun there’s no science to it. As for the breed it can be a challenge. It is easy to assign a breed to some models while others will look like one breed but will have a coat color that is not allowed in the breed standard. Fill out your Toe-Tags- First, check to make sure you're properly labeling your horses by checking the show packet or the show's website. NOT ALL SHOWS TAG THEIR HORSES THE SAME. Once you figure out the type of toe-tag, figure out how they want the information put on the tag. Some want all information on the front (Horse's Name, Breed, Gender, and Your Show #) but others want only the Breed and Gender on the front, with your Initials and Horse's Name on the back. If you choose to wait until show day to tag your horses, have all your pre-filled tags sorted so you can find the tags when needed. 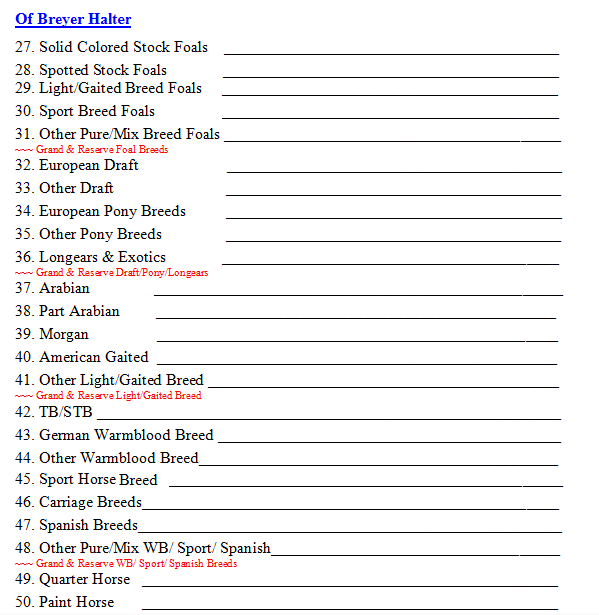 ​If you want to know what group (e.g., "sport" or "draft") your horse belongs to, check out NAMHSA's breeds list. It's best to put all you can about you horse. Remember to put down any Cards/Hang Tag that comes with Models with the collectability card you made for that horse (Pictured above) when you put your horse down. “First Call” means that a class is being called up to the judging table(s). You should bring your entries to the table at this time and start to set up. Example “First Call for OF Breyer Arabian in Ring One.” Often this will be followed by a second call. “Last Call” means that the class is just about to start being judged. This is your last chance to bring your entries to the table or make any tack/prop adjustments. “Class Closed” means that the class is now being judged. You can no longer touch your models on the table until the end of the class. “Class has been pinned” means that the judge is now finished and the ribbons have been placed on the table. You may now pick up your entries and ribbons. This is also when you may ask the judge questions about how they placed the class or what you could do better. “Clear the ring” means that there may be models left from the previous class and they need to be removed in order to start setting up for the next class. When the split is announced, you will need to listen to what the judge requests. Some times they ask for certain models to be removed and brought up later. Sometimes they are just moved to another table. You will want to do this as soon as possible; otherwise your horse may be disqualified. So for me I can some time show up to 60+ horses at one show. With the limited space I have leaving the totes empty or stacking them inside each other w/out the tops will not work for me (No room in house & too dusty in garage). I like to buy totes that fit into each other to save me room and so they can go in the garage & keep dust out of inside. 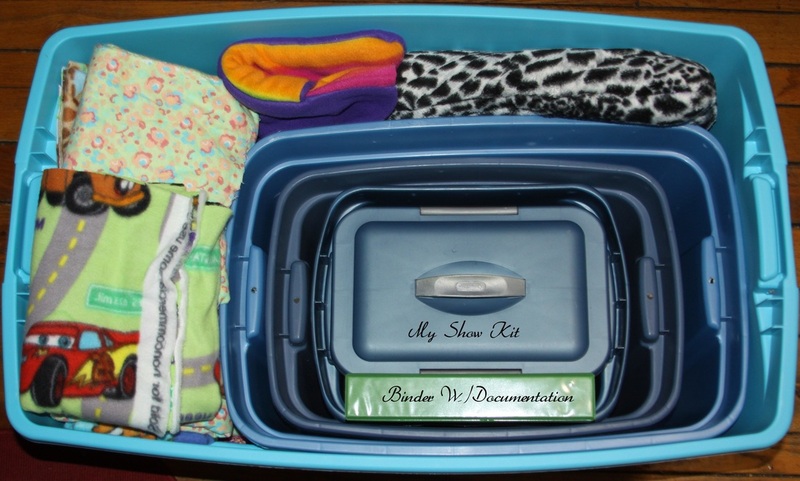 Here is how I pack mine (The big bottom tote is a roller tote. 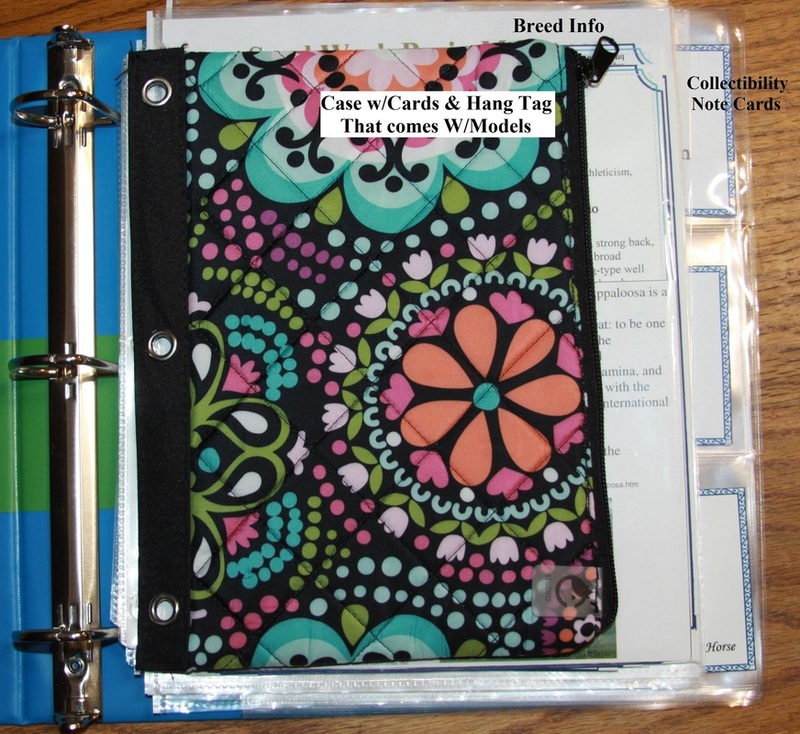 Note that buying a tote that doesn’t roll that size it will become heavy & bulky to carry once full.) I have one more tote fill with fabric pieces for wrapping models.